Wherever your in-flight destination, you want to turn up looking your best and with skin to impress. Perhaps you’re flying internationally for a professional conference or performance. Maybe you’re on the trip of a lifetime looking to capture the beauty of every new and magical moment through a lens. Or perhaps you’re doing a short-haul flight to catch up with the extended family at your gran’s 80th birthday party. Whatever your reason for travel, in-flight skincare problems remain the same. The cabin pressure on a flight drops so low when you’re airborne, the harsh environment and lack of moisture in the air damages skin cells and can leave you looking and feeling tired and washed out. But, don’t let this put you off travelling. You CAN achieve the bright, dazzling complexion you’d like to greet your welcoming committee with! If you’re planning a flight of any duration and you want to arrive looking your best, fasten your seatbelt and prepare for take-off. Here is the best of Biologi’s in-flight skin-tertainment. The dip in humidity causes severe dehydration for your skin which requires humidity and moisture to appear healthy and luminous. Apply Bd serum before, during (for flights over four hours), and after the flight. Bd serum doesn’t just hydrate; it locks the moisture in, so the active components can do their job as the air pressure drops. Apply Bd all over the face and neck, and you’ll arrive at your destination hydrated and glowing. As altitude increases, the amount of oxygen in the body decreases. The brain then kicks into survival mode and re-prioritises blood flow to deliver oxygenated blood to the vital organs such as the heart and lungs first, and the skin second. This is a natural physiological survival mechanism, but it can severely impact the tone and glow of your skin and you’re likely to arrive at your destination looking pale and lacklustre. The Bd contains anthocyanin which stimulates blood flow. Apply before and after a flight up to four hours long, and once during a longer flight. By the time you arrive at your destination, the actives will have helped the blood pump to the surface which will leave your skin bright and glowing, so you look and feel your best. Water retention is a common symptom of a flight as inactivity hinders water flow around the body. Puffiness from water is uncomfortable and, while it’s a temporary symptom, it can appear that you’ve gained as much as a few kilos during your flight! Move around during the flight to keep water moving. As soon as you land, apply a manual exfoliation (one that contains grains) to stimulate the skin followed immediately by Bd serum to encourage water and blood flow. Lack of sleep or an interruption to your sleeping pattern can leave your skin dehydrated, sagging, dull, and looking as tired as your body and mind both feel. When you get off a long-haul flight, thoroughly double cleanse to remove the toxins that have accumulated during the flight from your pores. Follow with a gentle exfoliation to remove the dead skin cells and finish with a generous application of Bk serum. With its potent anti-oxidising properties, Bk penetrates the cells at a deeper level to help your skin recover faster from the harsh conditions of the flight. Customised travel bottles are handy, but when your product contains 100% actives as all Biologi serums do, you need to avoid exposure to the air at all costs. 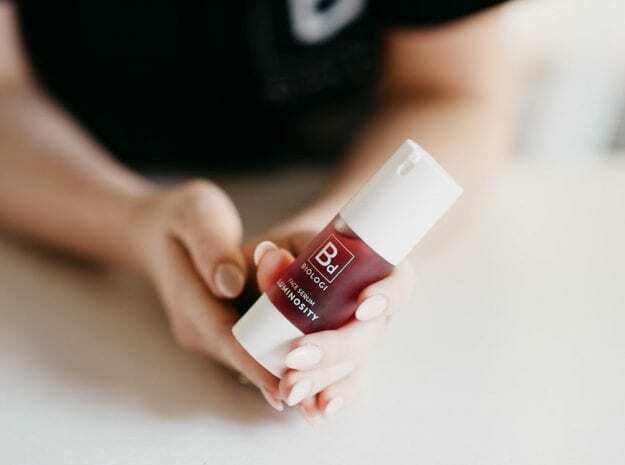 Because Biologi serums harness the plant’s internal cellular structure while they’re in the bottle, if you transfer the serum into a travel-friendly container as you might do with other products, you’ll expose the serum to oxygen which will release all the nutrients. Our pumps are airless to protect the product and transferring liquids to another bottle must be avoided. All Biologi serums are 100 ml, so they pass the liquid check* on international flights! Slip a bottle of your favourite serum into your in-flight essentials kit and let your handy travel companion do the rest. *Check with your airline before flying, the last thing you’d want is to have your serums confiscated due to a last-minute change in travel restrictions. Biologi is the essential travel item that can be used all over your body, on your face, and even on your lips! Whichever serum you use, you can guarantee you’ll arrive at your destination with glowing, hydrated skin, and the best bit…it’s completely natural!